TechKewlTM Standard Phase Change Cooling Vests V-neck w/zipper closure; hook & loop girth adjustments 100% cotton (excluding inserts)FR LinerIncludes front chest pocketKhaki,other colors available M / L (100-175 lbs.) Include one (1) set of Cool PaxTM Phase Change Cooling Inserts (6665) Phase Change Cooling Technology Key Benefits Commonly used under military combat gear, hazardous materials suits, mascot costumes, and other apparel. 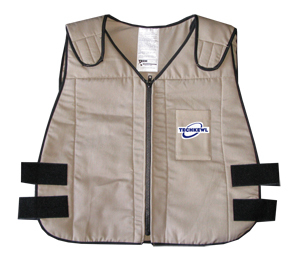 Provide cooling comfort and heat stress protection in high temperature environments. 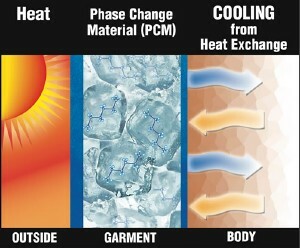 Phase Change Material (PCM) releases long-lasting, temperature-specific (58 degrees F, 14 degrees C), cooling relief. PCM is non-toxic, non-flammable, durable, reusable, lighter than water, and does not produce condensation. Easy to Use Submerge PCM inserts in ice water for up to 45 minutes, or place in a freezer, until solid. Return inserts to garment pockets. Wear; repeat steps as needed (or use additional inserts for continuous relief). Please choose size carefully as this item is NOT returnable. If you need assistance with size, please email us.